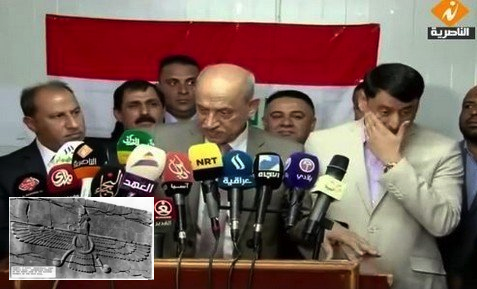 UFO SIGHTINGS DAILY: Iraqi Minister of Defence Says UFOs Used This Airport Back In 5,000 BC, Video, UFO Sighting News. Iraqi Minister of Defence Says UFOs Used This Airport Back In 5,000 BC, Video, UFO Sighting News. This was sent over to me by Christian Mace, a UFO researcher in France who runs the website ovniparanormal.over-blog.com. It is a video about the Iraqi Minister of Transportation during the opening ceremonies of a new airport...that he says was an airport back in 5000 BC during Sumerian times. It does seem that Sumairians did have ancient alien technology if you look at their stone carvings and depictions of flying machines. Perhaps he had inside information about it that he is now leaking. An Iraqi minister evokes an alien presence, Nibiru and the Anunnaki The Iraqi Minister of Transportation, fenjan Kadam during a press conference, made a sensational statement about aliens, Nibiru and the Anunnaki. He says the first astronaut was Sumerian (-5000 BC) and it was from the territory known today as Iraq took off from where their ships towards their planet. It is on the occasion of the inauguration of the new airport of El Naciria man Iraqi government says "This airport was first created on planet earth, El Naciria and it's a long story. There are probably not many people who has knowledge, namely the fact that it is the first airport constructed 5000 years before Christ. I invite those who doubt read the book of the great Sumerian historian Zecharia Sitchin, or the books of Samuel Kramer including one entitled "History begins at sumer" which speaks of the first airport constructed on planet earth, and is there (el Naciria). The particularity of this place is that it remains the safest for the landing and takeoff of aircraft, due to favorable weather conditions. When the Sumerians settled on this land, they were aware of this and have chosen specifically for their flights to other planets. The Sumerians were the first to discover the world number 12, called Nibiru. Samuel Kramer has made a big mistake when making reference to the Sumerian gods as enlil, Ishtar, etc ... "